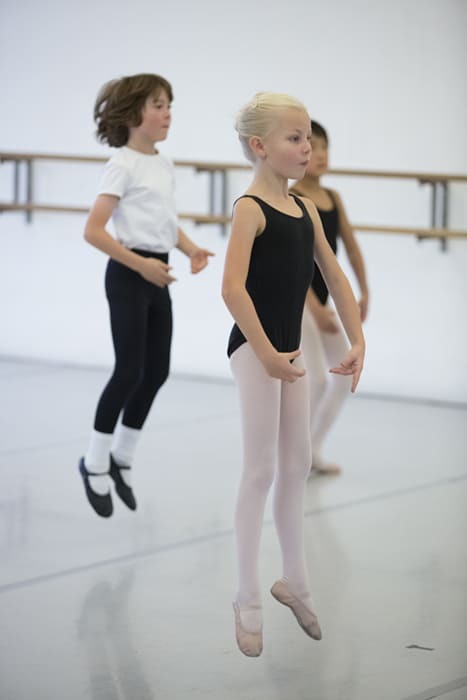 The Free Pre-Ballet Series introduces young dancers, ages 6-9, to the fundamentals of ballet. These free classes help children decide if ballet is right for them. We welcome all new dancers in this commitment-free, three-class series, with the goal of giving students the basic foundations and an appreciation of dance. Sign up and find out why TPB is Portland’s premier academy for nurturing, student-centered ballet training. The final class acts as a placement assessment for the Curriculum Ballet program. Students must attend the full series (all three classes) but are not required to pay an audition fee. Register early, as class size is limited. Classes that do not meet minimum enrollment may be cancelled. Female dancers should wear pink tights, pink ballet shoes and a leotard of any color. They should not wear skirts or tutus. Male dancers should wear black tights, a white t-shirt and black ballet shoes.